TOKYO--(BUSINESS WIRE)--Toshiba Corporation’s (TOKYO:6502) Semiconductor & Storage Products Company today announced the launch of the world’s first SDHC memory card with built-in NFC (Near Field Communication) functions. Sales of the 8GB, 16GB and 32GB cards will start from February 2015. The new cards will be featured at 2015 International CES, in Las Vegas, U.S.A., from January 6 to January 9. In order to find out what is stored inside SD memory cards, you usually need to put them into PCs or digital cameras. The new product utilizes the features of NFC technology to exchange data simply with a touch. By holding an NFC-enabled AndroidTM smartphone, with the app “Memory Card Preview”  installed, over the memory cards lets you preview the available storage space, as well as 16 thumbnails (max.) of the photos stored in the card. Smartphone app “Memory Card Preview” will be available free of charge from Google PlayTM Store at the same timing as the start of sales of the new product. 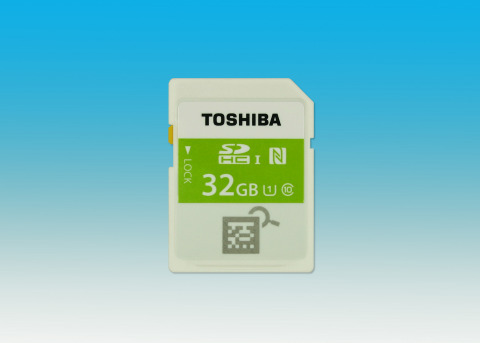 Toshiba has launched the world’s first SDHC memory card with built-in NFC (Near Field Communication) functions. Sales of the 8GB, 16GB and 32GB cards will start from February 2015.